The DOGON exhibition presents Dogon culture and art history from the 10th century until today through more than 330 exceptional pieces from international collections and presented together for the first time in France. Dogon area (Mali) art ranks among the best known art created by African cultures. The art from the Dogon area is considered as one of the best known art created by African cultures. Along with the masterpieces that have brought fame to Dogon art, the exhibition presents cultural and daily life objects that reflect the metaphysical and aesthetic concerns of the populations who made them. The typology of these objects, made with various and complex techniques, has rarely been revealed in light of the main pieces of the statuary ensemble. Over ten centuries of settlement history, of artistic and cultural influences are thus explored through a unique ensemble of essential masterpieces and unseen daily life objects that reflect the progressive settlement of Dogon area and the richness of its stylistic. The exhibition created by the musée du quai Branly shows the whole force of sculptural art developed by the Dogon, whether made of wood or metal, or expressed in large impressive pieces or powerful small objects. In the 2000 m2 Garden Gallery, the DOGON exhibition is set in three great thematic parts representing the culture and art history of the Dogon people through a variety of artistic outputs. Recent historical research on West Africa has revealed that populations in various areas of the region were not isolated. Migration waves, caravan itineraries, long-distance commercial trade and exchanges with other Bandiagara peoples had left behind an intricate network of contacts long before the arrival of Europeans. This is how the Dogon peoples could benefit from assets brought about by neighbouring civilizations. Beyond the apparent unity of a common identity built over the centuries, the statues in this part of the exhibition reveal the remarkable creativity of Dogon people and the great diversity of its artistic production. It explores the underlying complexity of Dogon area, falsely perceived as a cultural continuum. Divided in different styles corresponding to diverse groups of people or geographical zones, 133 exceptional sculptures exemplify this wealth of diversity: Djennenke, N’Duleri, Tombo, Niongom and Tellem, Gogon-Mande, Tintam, Bombou Toro, Kambari, Komakan, and the styles of the Séno plain and escarpment. Upon their arrival in the Bandiagara plateau, the Dogon encountered groups already living in the region and having developed a material culture. In the cliff’s area, Tellem sculptures and textiles found in the sanctuaries coexist with Niongom and Mande Dogon art, while Djennenke sculptures in the North of the plateau and Tombo pieces in its centre derive from different migration waves. 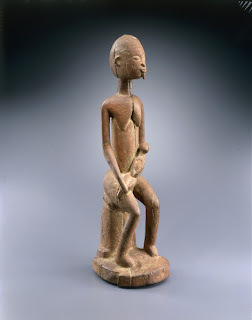 In the West, the emerging interest for Dogon art, from the 1893 Bandiagara conquest onwards is, above all, a scientific pursuit, fully expressed by the Dakar-Djibouti Mission (1931-1933). This part of the exhibition explores the institutional methods used during the gathering of the first collections, which were the first step towards spreading knowledge on Dogon art in the West. Two figures of the anthropological imagination, Louis Desplagnes and Marcel Griaule, exemplify how Dogon art captured European curiosity and taste. In 1907, in his book entitled Le plateau central nigérien, Louis Desplagnes tells about how he started the very first research on Dogon area arts and cultures after an expedition in the Bandiagara region. He unveiled cave art, remarkable for the liveliness and energy of its expression. His collections were then handed to the ethnography Museum of the Trocadéro. About twenty rupestral paintings are presented in this subsection. In Masques dogons (1938), Marcel Griaule introduces a very precise ethnographic typology. Favoured research subject, the Dogon mask plays a role in laying the foundations of this specific ethnological practice. 35 Dogon masks recall the classification proposed in his book. Along with scientific endeavours and new field research missions, the fascination for Dogon objects and sculptures is increasing. Collectors are not only seeking statuary Dogon objects, but also unique objects. A 35-minutes montage of excerpts from Jean Rouch’s Dama d’Ambarra (1974) adds to the first part of this sequence. The 140 objects exposed in the last section reveal that Dogon sculptors tend to express the original myth when creating daily life objects and architectural components such as jewels, bronze and iron objects, pulleys, doors, locks, seats, headrests, animal sculptures, altars, arches, cups and plates. They evoke the same magical and theological subjects as the sculptures displayed in the first part. At the end of the itinerary, the Pillars of Togu Na, the “House of Words” –open-construction built at the centre of Dogon villages - lead to the musée du quai Branly’s Djennenke statue, essential masterpiece of Dogon area art.